Point Pleasant freshman Jaden Reed (9) attempts a shot during the first half of the Black Knight’s 2-0 victory over Ravenswood on Wednesday night in Mason County. POINT PLEASANT, W.Va. — The crusade continues for the Black Knights. 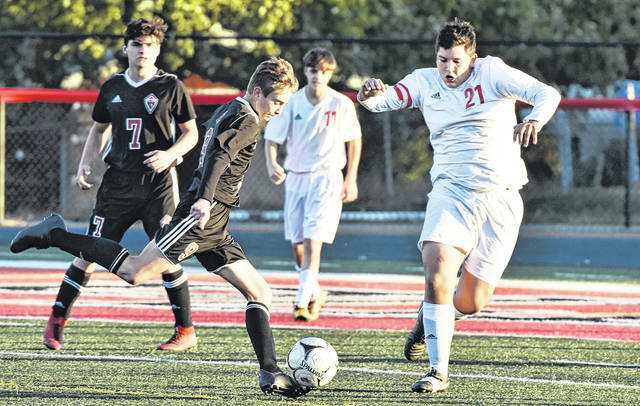 The Point Pleasant boys soccer team earned a 2-0 victory over visiting Ravenswood in the Class AA/A Region IV Section 1 tournament on Wednesday at the Ohio Valley Bank Track and Field in Mason County, as the Black Knights picked up their second win over the Red Devils this season. PPHS (17-2-0) opened the scoring in the contest, as Jaden Reed propelled the hosts to a 1-0 advantage at the 31:22 mark of the first period. The Black Knights carried a one-goal advantage into the intermission, as the hosts outshot RHS (9-12-1) by a margin of 8-6 through the first 40 minutes of play. Following the break, Point Pleasant’s Adam Veroski’s scored on an assist from Alberto Castillo to widen the margin to 2-0. The Black Knights outshot the visitors by a slim 18-12 overall margin, while also claiming a 5-2 edge in corner kicks. Point Pleasant junior goalkeeper Nick Smith finished with four saves, while Ravenswood senior Joshua Mize finished with nine saves. The Red Devils were whistled for eight of the 14 fouls in the contest. Following the victory, Point Pleasant coach Chip Wood was proud of his team’s effort in the win. The victory for PPHS was the second shutout win over Ravenswood of the 2018 campaign, as the Red and Black also had 1-0 triumph in the regular season, on Oct. 9 in Jackson County. The top-seeded Black Knights returned to action on Thursday to face third-seeded Williamstown at Shawnee Sports Complex in Dunbar, W.Va. The YellowJackets earned their way into the sectional championship contest by defeating Nitro on Oct. 16 by a final of 2-1.